Claudius, bishop of Turin from 818 to 827, a prolific but not original writer, was famous for his opposition to images: he tried--unsuccessfully--to get all images (which he called 'idols'), including crosses, removed from Turin's churches. 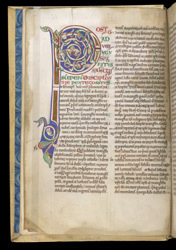 He doubtless would have disapproved of the decoration in this manuscript, which was at the Augustinian priory at Lanthony , in Gloucestershire, in the Middle Ages. The main text opens with an initial 'P' with a human head in an animal head towards the bottom of the shaft. The artist's leadpoint preparatory sketch is still visible in some places.